Imagine discovering what successful people have in common, distilling it into a set of simple practices, and using them to transform your company, your career, and your life. 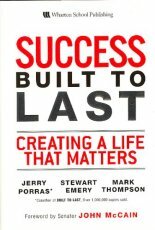 Authored by three thought leaders in organizational development and self-improvement -- including Built to Last coauthor Jerry Porras -- it challenges conventional wisdom at every step. Success Built to Last draws on face-to-face, unscripted conversations with hundreds of remarkable human beings from around the world. Meet billionaires, CEOs, presidents of nations, Nobel laureates, and celebrities. Meet unsung heroes who've achieved lasting impact without obvious power or charisma. Famous or not, almost all started out ordinary. Above all, discover why successful people stay successful and how you can too.